Versions have been found throughout Great Britain – including Shropshire, Gloucestershire, Surrey, Sussex, Herefordshire and Hampshire – but is believed to have been first published in 17th century Wexford County, Ireland, by Bishop Luke Waddinge (not to be confused with the Franciscan of the same name) in his A Smale Garland of Pious and Godly Songs (1684); see On Christmas Night All Christians Sing. The Garland was first circulated to members of his parish, and to surrounding communities in Wexford. 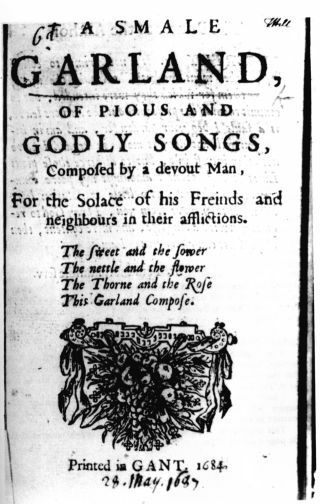 It would later be republished as A Pious Garland in 1728 and 1731, although the carols had been changed from the original (largely spelling, punctuation, capitalization, etc). 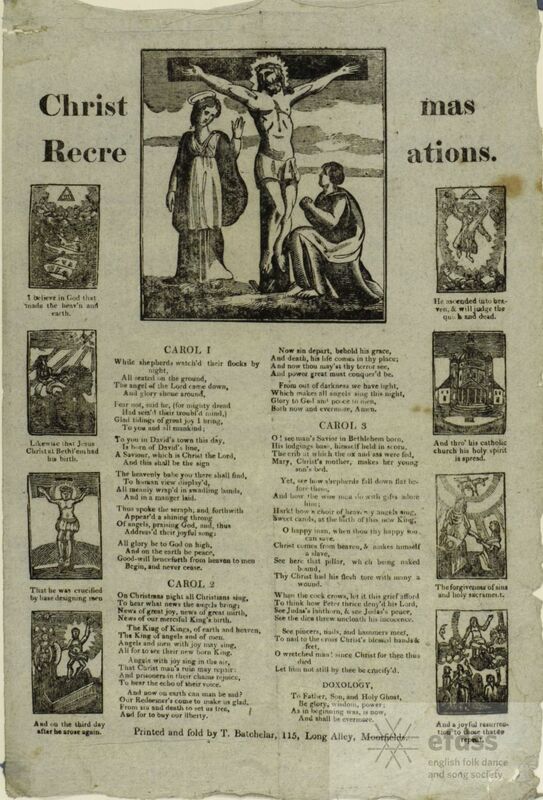 Numerous broadsides have also been published with this carol, including those in both London and Birmingham. The carol has also been frequently reprinted in Christmas carol collections. The original publication by Bishop Waddinge was the basis for Diarmaid O'Muirithe and Seoirse Bodley, The Wexford Carols. (Portlaoise: The Dolmen press limited, 1982), with excellent notes. See also Thomas Wall, The Christmas Songs of Luke Wadding, Bishop of Ferns 1683-1688. (Dublin, M.H. Gill and son ltd, 1960). Wall's texts were based on the 1728 reprint of “A Pious Garland”, which omits “On Christmas Night All Christians Sing.” He also has some good notes. See generally Joseph Ranson, "The Kilmore Carols" in The Past, no. 5, 1949, pp. 61-102. Three verses of 6 lines On Christmas Night. R. Vaughan Williams, "On Christmas Night" (Sussex), Eight Traditional English Carols (London: Stainer & Bell, Ltd., 1919), Carol #2, pp. 8-10, and Richard Runciman Terry, Old Christmas Carols. Part One. (London: Burns, Oates & Washbourne Ltd., n.d., ca. 1923), and Two Hundred Folk Carols (London: Burns Oates & Washbourne Limited, 1933). 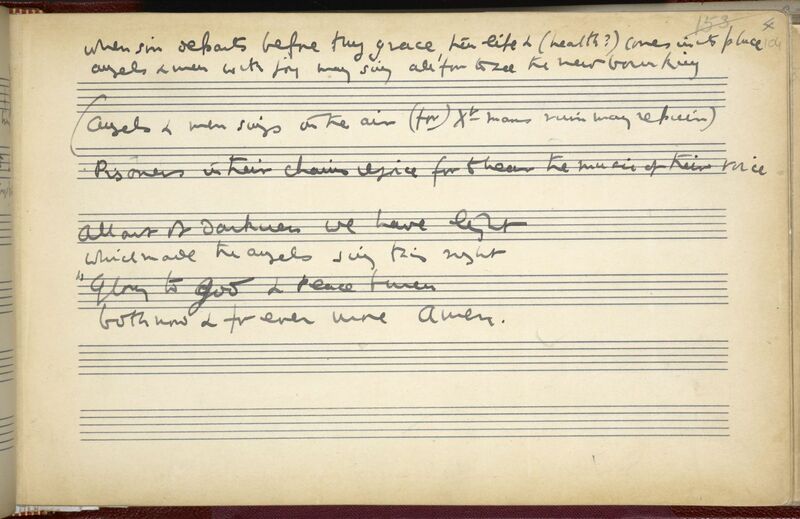 Compare: On Christmas Night - R. Vaughan Williams (1904). On Christmas Night True Christians Sing - Broadside Douce Adds. 137(22). On Christmas Night - Broadside Firth b.34(29). A New Carol Book, published by James Guest (Birmingham, c. 1830); I haven't been able to see the carol book, but a Broadside printed by him contains this carol: On Christmas Night - Johnson Ballads 1392A. On Christmas Night The Joy-Bells Ring (Culwick, 1904); see On Christmas Night (Broadwood, 1893). Percy Dearmer, R. Vaughan Williams and Martin Shaw, eds., The Oxford Book of Carols (London: Oxford University Press, 1928), #24, pp. 48-50. Hugh Keyte and Andrew Parrott, eds., The New Oxford Book of Carols. (Oxford: Oxford University Press, 1992), #139, p. 487. Erik Routley, ed., The University Carol Book (Brighton: H. Freeman & Co., 1961), #22, p. 31. Elizabeth Poston, ed., The Penguin Book of Carols (Harmondsworth, Middlesex, England: Penguin Books, 1965), #35, p. 102. Notes, p. 29. * The Daily Telegraph Book of Carols. (London: Continuum Books, 2006). Sir Philip Ledger (12 December 1937 – 18 November 2012), "On Christmas Night" (Oxford University Press, 1987); this arrangement was based on the melody and words collected by Dr. R. Vaughan Williams from Mrs. Verrall. Sir David Willcocks, "On Christmas Night All Christians Sing," in Carols for Choirs I (Oxford: Oxford University Press, 1961), #29, pp. 96-99; the arrangement was also based on the melody and words collected by Dr. R. Vaughan Williams from Mrs. Verrall. This arrangement was also published in 100 Carols for Choirs (Oxford: Oxford University Press, 1987), #59, pp. 242-245. And, an arrangement by Willcocks for sopranos and altos appeared in Carols for Choirs 4 (Oxford: Oxford University Press, 1980), #32, pp. 126-130. Performances at the "Festival of Nine Lessons and Carols," King's College, Cambridge, 20th Century, using the arrangements of David Willcocks (for example, 2002, 2004, 2009, 2011) and by Philip Ledger (for example, 1998, 2005, 2010). See, for example, Order of Service 2002, p. 20. Of the several tunes that have been associated with these lyrics, the most popular is the one noted by Dr. Ralph Vaughan Williams from Mrs. Verrall of Monk's Gate, Horsham, in Sussex, May 24th, 1904, and from whom is derived it's most popular nickname, “The Sussex Carol.” Williams first published the tune as part of his 1912 Fantasia on Christmas Carols, performed at the Three Choirs Festival, Hereford Cathedral. It was later published separately as Carol #2 in his Eight Traditional English Carols (1919); see On Christmas Night - R. Vaughan Williams. It is this tune that has been most often selected for inclusion in collections, and is the one most often heard. The tune was first printed in the Journal of the Folk-Song Society, Vol. II (1905), p. 127. 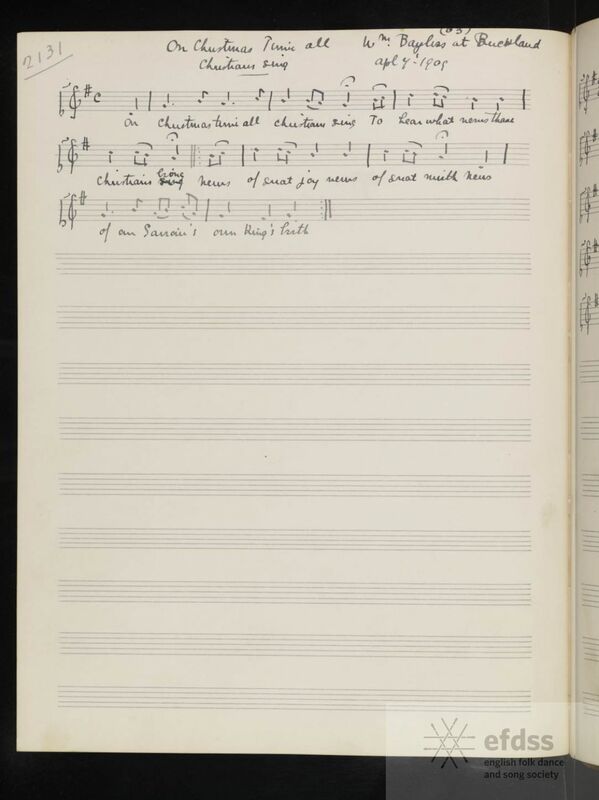 Sheet Music noted by R. Vaughan Williams, Journal of the Folk-Song Society, Vol. 2, p. 127. Following the sheet music, Miss Broadwood wrote that "Mrs. Verrall sang almost exactly the same words as Mr. Grantham, though fewer verses." The lyrics that Mrs. Verrall sang were not printed here; we know of them from the notes made by Dr. Williams in 1904 (below). Based on those notes, Mrs. Verrall sang only three of the five verses that were sung by Mr. Grantham (below). In both the Fantasia of 1912 and the carol of 1919, only three of these verses were included; the omitted verse was #3, Angels and men sing in the air. 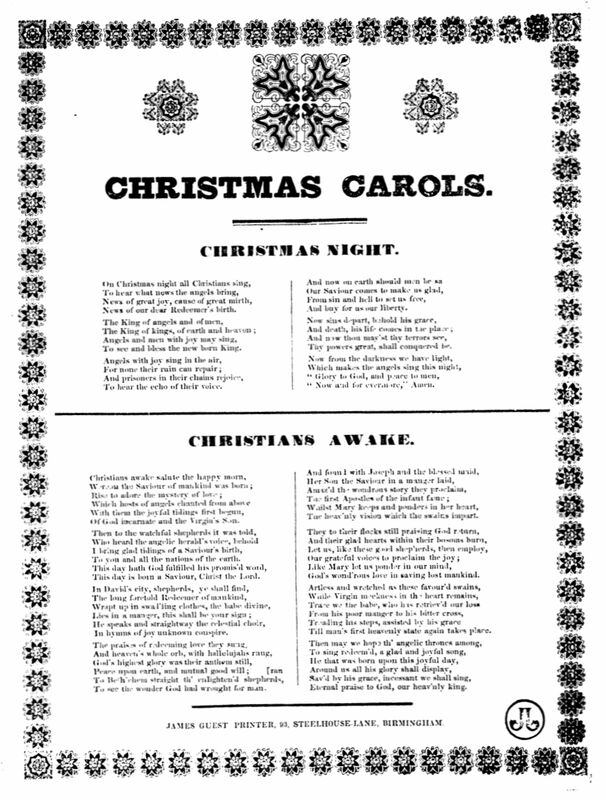 The version printed by Richard R. Terry in Old Christmas Carols and Two Hundred Folk Carols was identical to the version printed by Williams in Eight Traditional English Carols. This image was found at the Vaughan Williams Memorial Library. See the rest of that article for additional interesting details. Interestingly, Dr. Williams collected a second tune during this visit, this one from Mr. Verrall. The tune collected by Dr. Williams from Mr. Verrall on May 24, 1904. In addition to the Verrall tune collected by Dr. Williams, the Journal of the Folk-Song Society also published a tune and a verse collected by Dr. Culwick, and five verses and a tune collected in February, 1892, by Lucy Broadwood from Mr. Grantham (Carter), Holmwood, Surrey; see On Christmas Night - Broadwood. The tune that Miss Broadwood noted was different than that noted by Dr. Williams. 4. Why on earth can man be sad ? 5. From out of darkness we have light.
" I have certainly not heard this for the past forty years. I have written it from memory of my mother's singing. She said when she learned it the recital lasted nearly an hour. There were about ninety verses sung, slowly, by a man with a strong, rough and deep bass voice." Permanent URL: http://www.vwml.org/record/LEB/5/127 ; The filename was BRO-05-204.jpg. The other verses to "On Christmas night, the joy bells ring" have not been recorded, if any. In the only sheet music that I've seen, three verses of "On Christmas Night All Christians Sing" are used. See On Christmas night the joy-bells ring at John Speller's Web Pages - Christmas Carols. In the 1935 The Cuddesdon Nativity Play, reference was made to this carol, citing, as its source, "Church and School Hymnal" (London: SPCK, 1926), #305. I also saw a reference in the "revised" edition of Hymns Ancient and Modern. In 1952, Vaughan Williams used the "Joy Bells" tune in his composition, "Prelude on an Old Carol Tune." It has been frequently recorded, and can be heard and seen on YouTube. 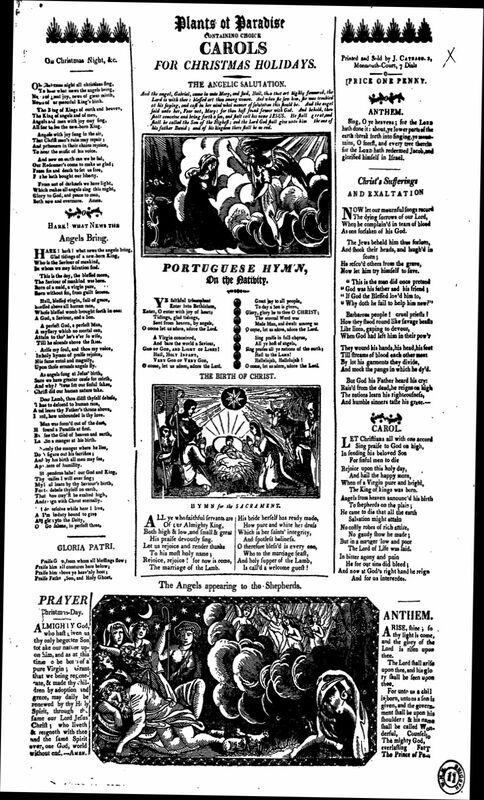 In the article in the Journal, Miss Broadwood suggested that the reader compare the three tunes published there with “Hark, Hark, What News” in William Sandys' Christmas Carols (1833). She also observed that the words of both these were still being annually printed up to 1823 on ballad-sheets. She was making reference to William Hone's list of the 89 carols that were still being printed; see: Christmas Carols Now Annually Printed which appears in his chapter on "Christmas Carols" in Ancient Mysteries Described (1823, pp.97-99). At the Broadside Ballads Online web site at the Bodleian Library, Oxford, five Broadsides were found that contain this carol. Of these, two had very similar lyrics while three had very different lyrics. Imprint: Printed and Sold by J. Catnach, 2, Monmouth-Court, 7 Dials, London, between 1813 and 1838. Imprint: James Guest, Printer, 93, Steelhouse-Lane, Birmingham, between 1834 and 1879. Imprint: D. Wrighton, Printer, No. 86, Snow-Hill, Birmingham, between 1812 and 1830. 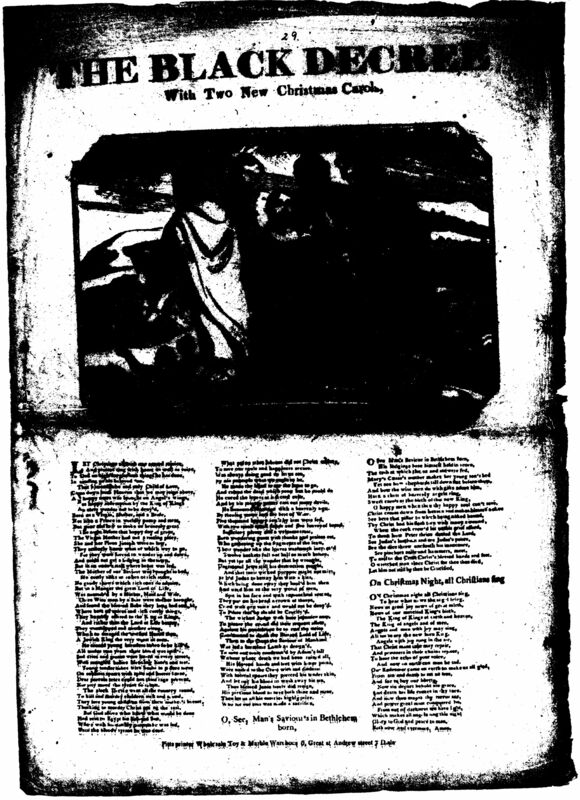 On this website: On Christmas Night True Christians Sing - Broadside Douce Adds. 137(22). Imprint: Pitts printer wholesale Toy & Marble Warehous [sic] 6, Great st Andrew street 7 dials, London, between 1819 and 1844. On This website: On Christmas Night - Broadside Firth b.34(29). (between between 1817 and 1828). A different tune appeared earlier in the very influential collection by Henry Ramsden Bramley and John Stainer, Christmas Carols New and Old, Third Series (1878), Carol #56, which also had a variation on the first line, “On Christmas Night True Christians Sing.” The tune was from the immensely prolific Arthur Henry Brown. This version consisted of three verses of 10 lines (and like Bishop Waddinge's original, consisted of all six of the 4-line stanzas). 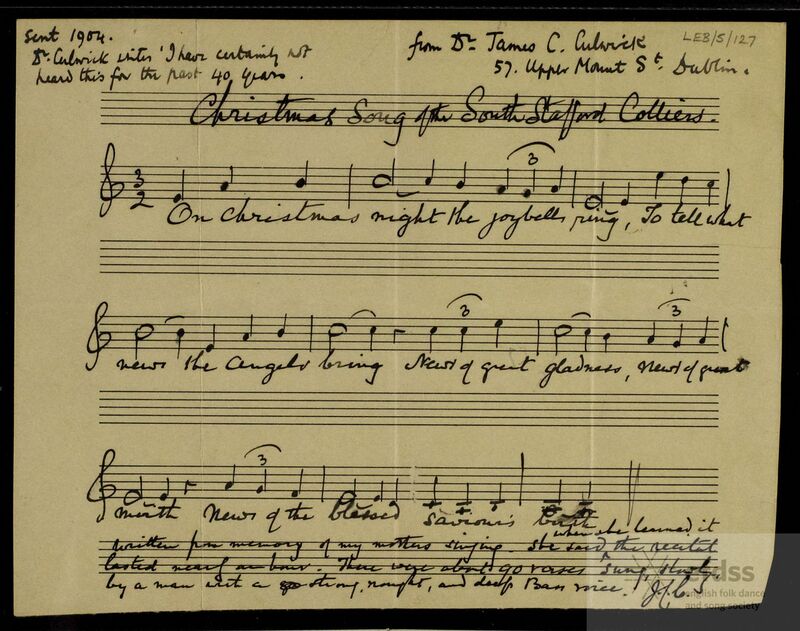 There was one other collection that had the "True Christians sing" variant: Christmas Night from A Good Christmas Box (1847). The earliest version that I've found was on Broadside, dated between 1821 and 1827, On Christmas Night True Christians Sing-Douce Adds. 137(22) (Broadside, right), from the press of T. Bloomer, Printer, 53, Edgbaston-street, Birmingham, who was in business between 1821 and 1827. 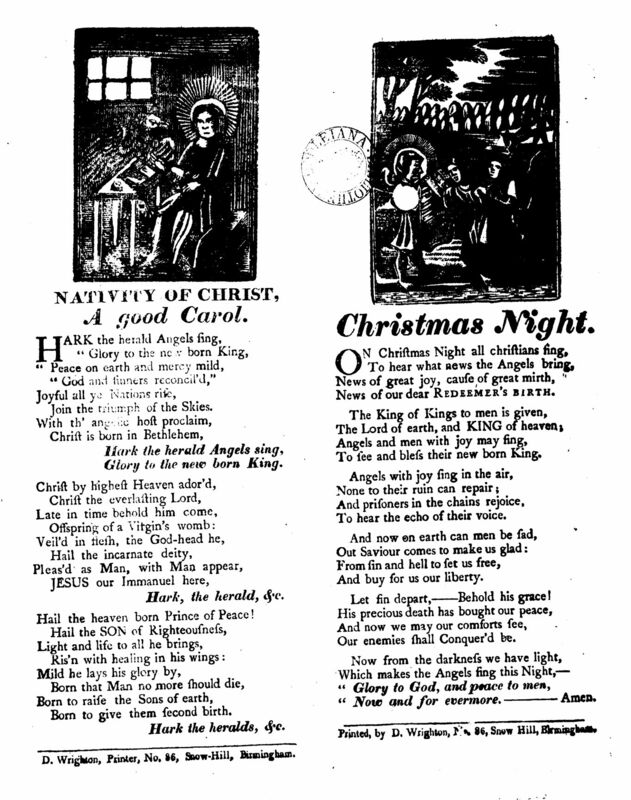 Sharp also mentioned a Broadside of the carol (see right) printed by T. Batchelor of Moorfields: On Christmas Night - The Batchelar Broadside. Elizabeth Poston also printed a copy of this carol consisting of four verses of 4 lines, without a chorus, in The Penguin Book of Carols (Harmondsworth, Middlesex, England: Penguin Books, 1965), #35, p. 102 (Notes, p. 29). The carol has appeared several times at the King's College, Cambridge, "Festival of Nine Lessons and Carols." Two arrangements are used, either by David Willcocks (2002, 2004, 2009, 2011) or by Philip Ledger (1998, 2005, 2010). Both arrangements were based on the melody and words collected by Dr. R. Vaughan Williams from Mrs. Verrall. Willcock's arrangement first appears in the first Carols for Choirs, Carol #29, Oxford University Press; it was based on the. See, for example, Order of Service 2002, p. 20. The performances by the Choir at King's College has been posted to the YouTube several times, including the services in 2009 (the David Willcocks arrangement) and 2010 (the Philip Ledger arrangement). Erik Routley's arrangement in the 1961 University Carol Book, #22, adds a modal inflection to the setting according to the article “Sussex Carol” from Wikipedia. Because it is under copyright, it is not reproduced here. The editors of The Oxford Book of Carols had two settings, both from The Journal of the Folk-Song Society. The first was the melody from Mrs. Verrall noted by Dr. Vaughan Williams, while the second was the setting noted by Dr. Culwick in 1904 from his mother in Dublin. The text was the four verses from Mrs. Verrall, with the first two lines repeated. Hugh Keyte and Andrew Parrott also included two settings in their 1982 volume, The New Oxford Book of Carols, both being arrangements of the tune noted by Dr. Williams from Mrs. Verrall, from The Journal of the Folk-Song Society. The text was four verses of four lines, without a chorus, described as "after Bishop Luke Wadding, d. 1686." This delightful carol, which so joyously celebrates the announcement of the birth of a Savior, our Redeemer, should be more frequently heard in the US, and I am confident that listeners here would embrace the carol as devotedly as those in Great Britain. 1. On Christmas Night, All Christians Sing - Waddinge, A Smale Garland of Pious and Godly Songs. (1684). Three verses of eight-lines (presumably also appeared as six verses of four-lines). 2. On Christmas Night - Broadside Harding B 7(58) (between 1813 and 1838). Five verses of 4 lines, with notes. 3. On Christmas Night - The Batchelar Broadside (between between 1817 and 1828). Five verses of 4 lines. 4. On Christmas Night - Broadside Firth b.34(29). (between 1819 and 1844). Six verses of four lines. 5. On Christmas Night True Christians Sing - Broadside Douce Adds. 137(22) (between 1821 and1827). Six verses of four lines. 6. 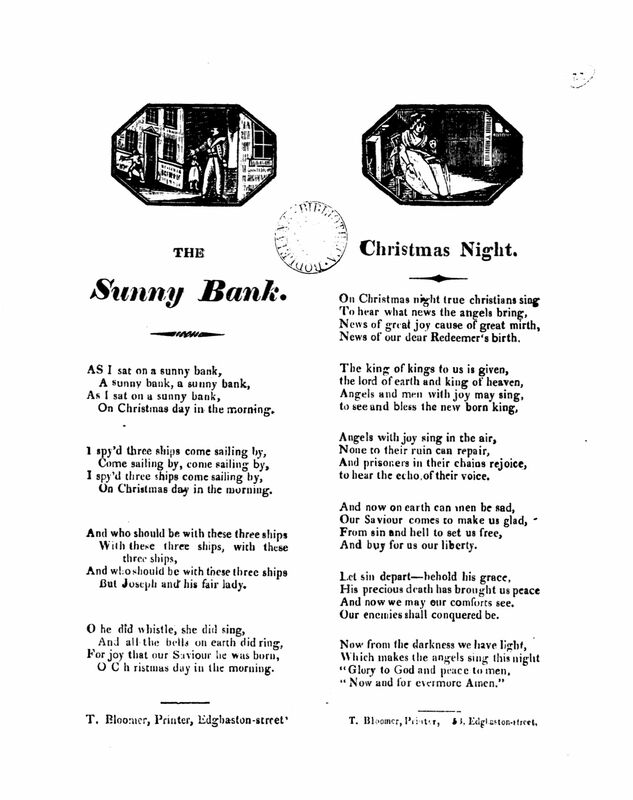 On Christmas Night - Broadside Johnson Ballads 1392A (between 1834 and 1879). Six verses of four lines. 7. On Christmas Night True Christians Sing - A Good Christmas Box (1847). G. Walters, A Good Christmas Box (Dudley: G. Walters, 1847, Reprinted by Michael Raven, 2007), pp. 20-21. Six verses of four lines. No chorus. 9. On Christmas Night True Christians Sing - Bramley & Stainer (Henry Ramsden Bramley and John Stainer, Christmas Carols New and Old (London: Novello, Ewer & Co., 1878), Carol #56, p. 130. Three verses of ten lines; 4th line and 9th line doubled (a combination of six verses). Also found in Charles R. Hutchins, Carols Old and Carols New (Boston: Parish Choir, 1916), #230. Sheet Music by Arthur H. Brown. 10. On Christmas Night - Broadwood, (Broadwood, 1892, Surrey). Five verses of six lines. Printed in JFSS, Vol. II, p. 127. 11. 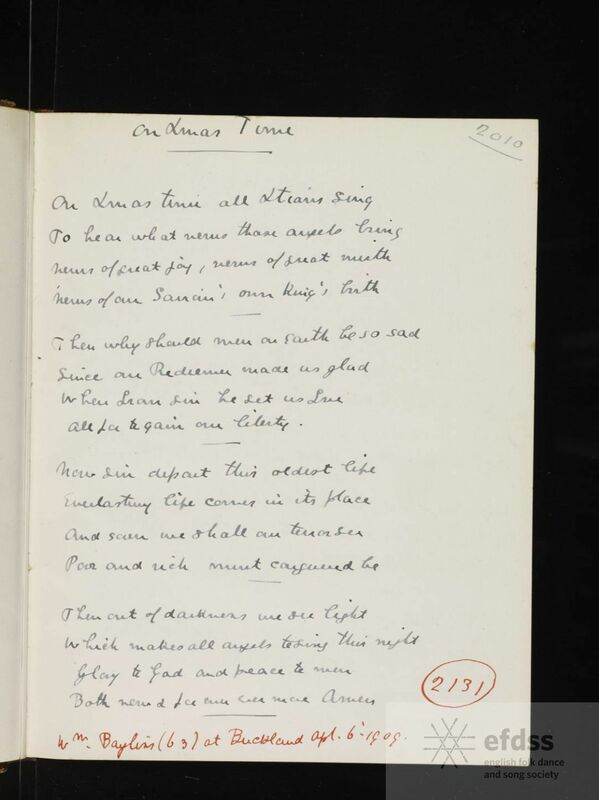 On Christmas Night - Williams - (Noted from Mrs. Verrall, Sussex, 1904, four verses of 6 lines). 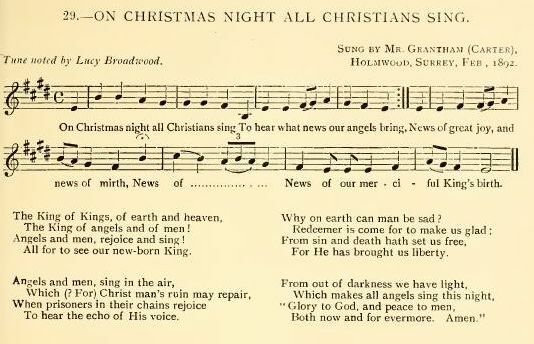 Note that Dr. Williams gives only three of these verses in "Fantasia on Christmas Carols" (1912) and Eight Traditional English Carols (1919). 12. On Christmas Times All Christians Sing - Gardiner and Guyer - Three verses of 4 lines. Words and tune collected from George Blake of Southampton, Hampshire, on June 6, 1906 by G. B. Gardiner and John F. Guyer. 13. 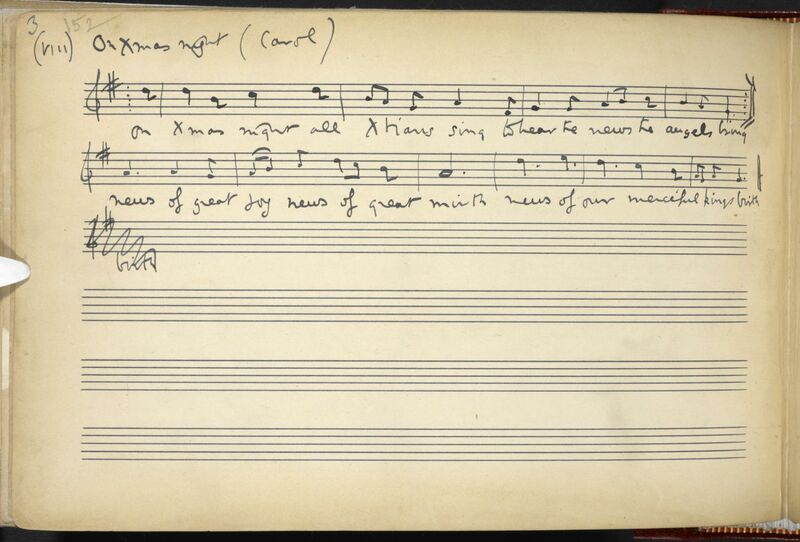 On Christmas Night - Cecil Sharp - Four verses of 4 lines, no chorus. Noted from William Bayliss, 1909, Gloucestershire, printed in Cecil J. Sharp, English Folk-Carols (London: Novello & Co., Ltd., 1911), #10, p. 24. 14. On Christmas Night - Three verses of six lines, an adaptation of the carol collected by Ralph Vaughan Williams in 1904, published in 1912 as part of "Fantasia on Christmas Carols" and in 1919 in Eight Traditional English Carols, Carol #2, "On Christmas Night" (Sussex), pp. 8-10 (verses 1, 3, and 4). Also found in Richard Runciman Terry, Old Christmas Carols. Part One (1923) and Two Hundred Folk Carols (London: Burns Oates & Washbourne Limited, 1933), #28, p. 49. Rev. Terry's lyrics are identical to the first arrangement by Dr. Williams, and Rev. Terry — like Dr. Williams — gives verses 1, 3, and 4. 15. On Christmas Night (1) – Five verses of 5 lines (the last line is repeated). Source lost. 16. On Christmas Night (2) – Four verses of four lines. Source lost. 17. On Christmas Night (3) – Four verses of six lines (the first two lines of each verse are repeated). Source lost. 18. Sussex Carol ("On Christmas night all Christians sing"). Four verses of four lines, with chorus. Source lost. And see On Christmas Night - Sheet Music. Editor's Note: Why so many "source lost" mentions? Originally, I was collecting only for myself. But in my 50th year, I was twice hospitalized with only a 50-50 chance of recovery both times (I'm 63 now, and doing fine). At that point, I'd already collected over 1,300 hymns and carols, and wanted to share the collection with others, via a web site. While I've tried to go back and recreate some of this research, as you can see, there remains more work to do in this respect. Ian Bradley, ed., The Daily Telegraph Book of Carols. (London: Continuum Books, 2006), #58, p. 256. Henry Ramsden Bramley and John Stainer, Christmas Carols New and Old (London: Novello, Ewer & Co., 1878), Carol #56, p. 130. Charles R. Hutchins, Carols Old and Carols New (Boston: Parish Choir, 1916), #230. Sheet Music by Arthur H. Brown. Journal of the Folk-Song Society (JFSS), Vol. II (1905), p. 127. Diarmaid O'Muirithe and Seoirse Bodley, The Wexford Carols. (Portlaoise: The Dolmen Press Limited, 1982), with excellent notes. Hugh Keyte and Andrew Parrott, The New Oxford Book of Carols. (Oxford: Oxford University Press, 1992), #139, p. 487. Elizabeth Poston, The Penguin Book of Carols (Harmondsworth, Middlesex, England: Penguin Books, 1965), #35, p. 102. Notes, p. 29. Joseph Ranson, "The Kilmore Carols" in The Past, No. 5, 1949, pp. 61-102. At "Ask About Ireland: Music and Manuscripts": Part One and Part Two. Erik Routley, The University Carol Book (Brighton: H. Freeman & Co., 1961), #22, p. 31. Cecil J. Sharp, English Folk-Carols (London: Novello & Co., Ltd., 1911), #10, p. 24. Richard Runciman Terry, Two Hundred Folk Carols (London: Burns Oates & Washbourne Limited, 1933), #28, p. 49. Bishop Luke Waddinge, A Smale Garland of Pious and Godly Songs. (Ghent, 1684); reprinted in London in 1728 and 1731. See: Christmas Carols of Waddinge and Devereux. Thomas Wall, The Christmas Songs of Luke Wadding, Bishop of Ferns 1683-1688. (Dublin, M.H. Gill and son ltd, 1960). Wall's texts were based on the 1728 reprint of “A Pious Garland”, which omits “On Christmas Night All Christians Sing.” He also has some good notes. See: Ask About Ireland: Music and Manuscripts. G. Walters, A Good Christmas Box (Dudley: G. Walters, 1847, Reprinted by Michael Raven, 2007), pp. 20-21. Dr. Ralph Vaughan Williams, Eight Traditional English Carols (London: Stainer & Bell, Ltd., 1919), Carol #2, "On Christmas Night" (Sussex), pp. 8-10 (verses 1, 3, and 4). Wikipedia articles concerning “Sussex Carol” and ""Fantasia on Christmas Carols""
The Vaughan Williams Memorial Library, at the website of The English Folk Dance and Song Society (efdsshttp://www.efdss.org/). It also hosts the Cecil Sharp House. This site was especially helpful in locating source material for "On Christmas Night," Roud Number 597. The site has numerous original research notes from Cecil Sharp, Ralph Vaughan Williams, Lucy Broadwood, George Butterfield, and others.